1. 15-YEAR-OLD GIRLS ON THE OTHER SIDE OF THE WORLD CAN TEACH US WAY MORE THAN WE CAN TEACH THEM. Gladys, Jessica, Jennifer, Faith and Ester showing us their classroom at the Tembea Girls High School in Kajiado, Kenya. We spent a few days at Tembea Girls High School in Kajiado Kenya to check out the school grounds (we’re helping them get a sports field built there next year) and teach them some physical education. We played sports with the girls and showed them as many new fun ways to stay fit as we could. But, that was nothing compared to what they taught us. We were complete strangers, and yet they opened their hearts to us showing us what friendship and compassion can look like. They showed us that having no electricity or running water or (in the worst cases) family isn’t a hindrance to achieving great things and being an inspiring woman. In fact, it might be just the opposite. These girls had wisdom and perspective beyond their years. One afternoon, we asked them whom they admired in their lives and why. They took their time and thought about it, then looked us in the eyes and said “You, because you had a dream and followed through with it.” If they ask us the same question one day, we would reply with the same answer. 2. PEOPLE WITH THE BIGGEST HEARTS DON'T NECESSARILY HAVE A BIG BANK ACCOUNT OR BIG HOUSE...OR MUCH OF ANYTHING AT ALL. In Peru, we stayed a night with an Uros family in their floating village on Lake Titicaca (google it, this place really exists)! We spent the day with them learning how they make their islands, houses and boats out of reeds and dressed up in their traditional clothing and fishing for our dinner. (We looked like the love children of Rainbow Brite and Buddy the Elf.) That evening our new friend, Sayida, a 28-year old who grew up on the island, told us that one of the older women (who we had spent the whole day with and assumed was part of the family) was not related to them at all. She was actually just “adopted” by them two weeks prior after being ostracized by her own family because of her disabilities. What really struck me about this story is how Sayida told it. She found nothing extraordinary about what they had done. By our standards, her family didn’t have much, but still, they didn’t hesitate to give a stranger in need what they could...for no other reason than because they could. 3. STOP WORRYING ABOUT GETTING WHERE YOU'RE GOING AND LOOK AROUND. YOU WILL END UP WHERE YOU'RE SUPPOSED TO BE AND SO ENJOY EVERY SECOND OF THE JOURNEY. 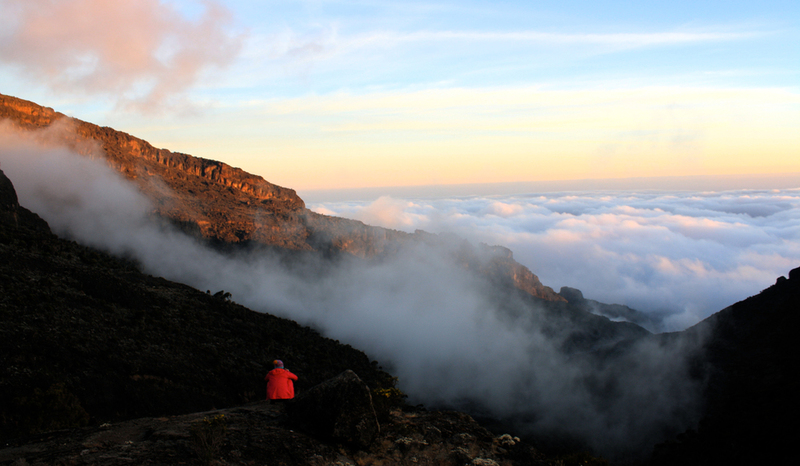 Me enjoying the sunset from above the clouds at barranco camp on Mt. Kilimanjaro. This was our second time this year to summit Mount Kilimanjaro; I’m fairly certain the mountain hadn't changed since we were last there. We still passed through the five uniquely beautiful ecosystems and getting to the summit was still very hard and very cold. But, it was all exponentially more beautiful. I photographed birds taking flight. I watched the clouds roll in and out of our campsites in the early evening and the constellations in the night sky. I noticed hidden caves off the trail. Not one of those things do I remember from the last time I was on Kili. Yet each of them were take-your-breath-away-amazing. On my first trek, I spent so much time worrying whether or not I’d make it to the summit that I overlooked much of the beauty that was all around me. Maybe it was my experience that made it easier the second time, but I honestly think it was being truly in the moment that changed things. I feel so lucky to have had the rare opportunity to go back see the beauty of Kili again and to really take it in. One thing is for sure, I can’t wait for what I’ll see next time knowing this. 4. BEER MAKES THE WORLD A HAPPIER PLACE! Allison and I rocking out in our dirndls in the Löwenbräu tent at Oktoberfest in Munich, Germany. This seems so obvious. Most of us have an appreciation for booze of all kinds. But seriously, the Oktoberfest Wiesn just might be the happiest place on the planet earth. It’s awesome to see so many people from all walks of life and every corner of the world come together just to have a good time. It might be what dancing around to oompah music in a dirndl will do to a girl. Or, it might be the beer. Whatever it was, I’ve never felt so much unadulterated joy. If you haven’t been to Munich for Oktoberfest, go. Trust me. 5. HOME ISN'T A PLACE. Surprisingly, not once during the 51 days did I feel homesick. Sure, I missed my dog, and technology lets us stay somewhat connected to friends and family wherever we are. The feeling of comfort that we associate with “home” doesn’t come from being in a particular place...or even somewhere familiar for that matter. It’s a comfort and peace that comes from within and from opening up to the people around you. When I quieted the chaos in my mind and lived in the moment, I felt at home wherever I happened to be, in whatever state I was in. You can find a sense of family and home wherever you are. Talk to the locals. Ask them questions. Listen to their stories. Share your stories. Try to see the world through their eyes. Spend time living how they do. Basically, open yourself up to them, and they will open up to you. You’ll see that we are not all that different. You’ll see that it’s within your power to make anywhere you are home.